We did the Fori in earnest, starting with Capitol hill, through the Foro Romano and up to the Palatino. The list of monuments contained in the forumlooks overwhelming: Tabularium, portico of Dii Consentes, temple of Vespasian, temple of Concordia, temple of Saturn, column of Phocas, basilica of Maxence and Constantine, basilica Aemilia, to name barely half of them. In truth, most of them remain only as a single column or a floorful of column bases, with nothing to actually see (except the fact that ancient Rome must have been one cluttered place). 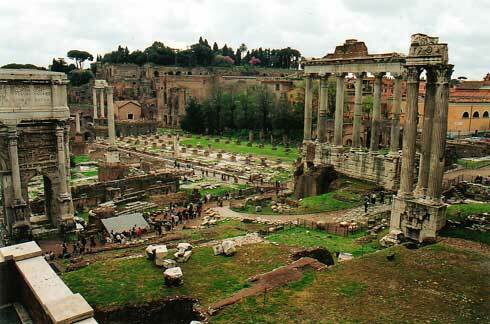 So while I had planned for 2 or 3 days to spend in the fori, we ended up exhausting them well within one morning. Uh-oh. Due to Rome's very poor treatment of its archaeological sites, one of the most significant (if only symbolically) monuments of the forum was completely unnoticeable to anyone who hadn't read up on it in a guidebook prior to the visit: Lapis Niger, a square of "black stone" placed by Caesar on vestiges considered since antiquity as highly venerable because they were the tomb of Romulus (archaeologically this was found to make sense in the sense that the very first settlements sprouted from there). It is now surrounded by a fence so people won't walk on it, but there is no trace of a sign explaining it, which makes it virtually invisible amidst all the taller monuments. The Palatino however was a pleasant surprise. 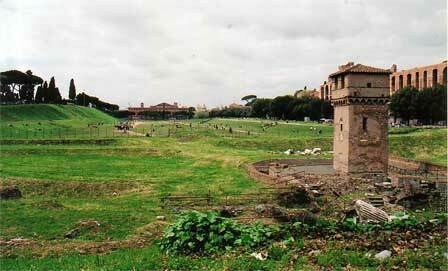 The hill is one large tree-shaded garden interspersed with the remains of villas and one beautiful stadium now covered in lush green grass (see on the right). 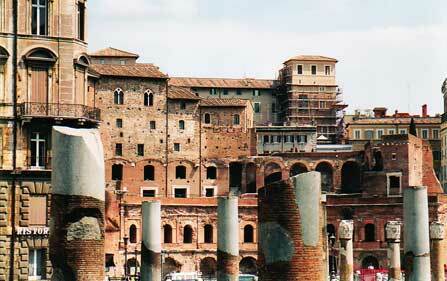 The Palatino is the cradle of Rome, where the primitive village that began it all stood. 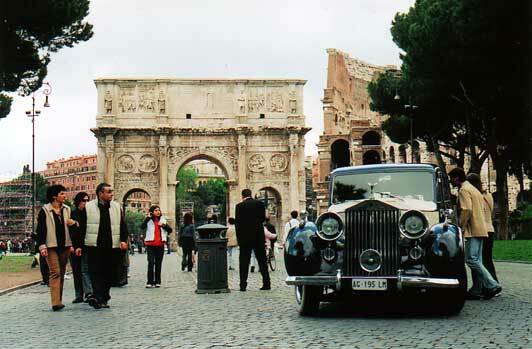 The arch of Titus has to share the limelight with this beauty in this one! 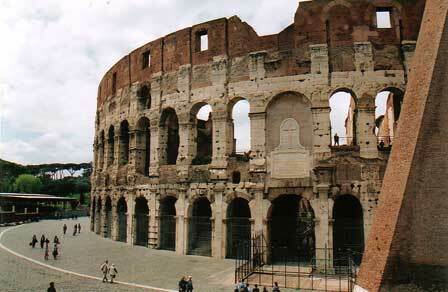 We descended the hill from the other side and marched right into the Colosseum without having to queue. Konrad told me later that the queue usually goes all around the building, but there's my luck at work again for you. Even eviscerated, the Colosseum commands respect. It deserves its name, even though the reason it was called that was because it was built next to the location of a colossus representing Nero. It was badly damaged by the earthquakes of 1231 and 1255, and in the 15th century it became a vast quarry for all the inhabitants of Rome to freely grab building materials. The devastation only stopped when Pope Benedict XIV consecrated the place as holy ground (in the belief that Christians had been martyred there, which is currently in doubt). 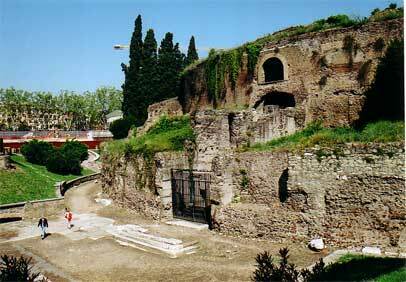 When we headed to the Circus Maximus I expected to see something similar but in the shape of a hippodrome, and was shocked to find that not one stone remained of the largest circus in the world (250,000 spectators!) except an elongated depression in the grass where people picknicked and played football. Nearby stands a tall structure taken in Ethiopia a long time ago and re-erected there like the many obelisks taken from Egypt. It is a sacred monument to the Ethiopians [several years later, traveling to Ethiopia, I found out it was an Aksumite stela], and they have been demanding it back for a while. Just when Italy accepted to return it, it was struck by lightning... and is now too fragile for transportation. 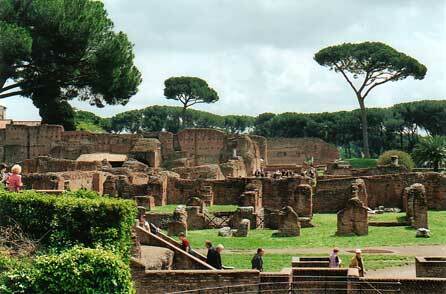 We went on to something that was high on my list: the thermes of Caracalla. Caracalla was one of the nastiest emperors Rome has ever known, but he was Phoenician and I had to see what traces he left. As it turned out, it was a little more than a trace – a huge, massive complex whose ceiling is gone but is otherwise very well preserved. 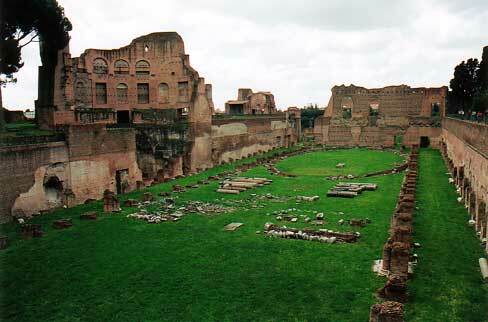 Thermes were actually vast social complexes wih attached libraries, gymnasiums, stadiums, shops, etc. Instead of meeting over lunch, these gents simply met over a bath. That habit is long gone, but one thing that can be said for the Italians is that they are still obsessed with hygiene, to the extent that football players often take a shower during half-time. You gotta love that. 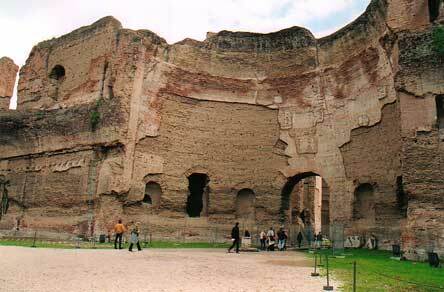 Anyways, Caracalla's thermes functioned up to the 6th century AD, when the Goths cut off the aquaducts. And for the next 12 centuries, western Europeans never saw a bath again unless they were pushed in. Konrad had to return to the office so I had three more days on my own. I spent Tuesday going back over places we'd visited together -- the Corso, Piazza del Popolo, di Spagna, Navona, Pantheon -- and taking my time to shoot and visit. I also had a look at Augustus' mausoleum, unfortunately closed, but still quite imposing, especially with greenery overtaking it like that.